Staff cares about guests, and told us about great places to visit in the area while there. In-town, small RV park with motel accommodations, too. Sites were level, gravel, wi-fi was good. Within walking distance to restaurants (not many open on a Sunday in this town). Pull-thrus, back-ins, tents. Convenient to many attractions, and to snow birds. Sites were fine for big rigs. We'd stay here again. Liked it better than the other place just north of here, even tho it was more expensive. We camped at Hitch-N-Post Campground in a Travel Trailer. This is an in-town level gravel park. The facilities are older but well maintained and clean. This park should have a higher rating average but it has been around a long time and the current owners have done alot to improve it. We normally do not camp in town but were approaching holiday weekend and the owners were very kind worked us in. We were on our 4th week traveling and 2K miles from home and need a few down days. Little did we know that a medical emergency would would extend our stay and give us the opportunity to check out the local Hospital ER. Kudos to the Hospital and the Park and their owners for making us feel at home and comfortable. We camped at Hitch-N-Post Campground in a Travel Trailer. Brief visit to Bryce Canyon National park while traveling to Yellowstone NP. Park is in town and fit our needs for an overnight stay. The park was within a reasonable drive to Bryce Canyon NP. It's location in town was convenient to a grocery store as well as local restaurants. Not much available for amenities but had a nice laundry room and showers were hot and clean. I'd stay here again We camped at Hitch-N-Post Campground in a Travel Trailer. Weekly rate used. The owners are two of the nicest and most helpful people we have met during our travels. They go the extra mile to ensure you have a great stay including leading an ATV ride for a day. We camped here in our 27' travel trailer. Some of the sites are small but they do have sites up to 80' to accommodate large RVs. 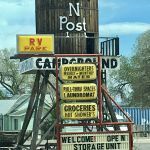 Great location to the downtown Panguitch area. Easy to walk or ride your bicycle or ATV. We will definitely stay here again next time through this area. We camped at Hitch-N-Post Campground in a Travel Trailer. Not a resort by any means but the fundamentals are all here and work well. Friendly staff. Wi-Fi was very strong and fast. We camped at Hitch-N-Post Campground in a Travel Trailer. Level sites at this park located right off main street in town. Okay for an overnight. We camped at Hitch-N-Post Campground in a Travel Trailer. This appears to be an old park with new owners and manager that are just starting out. The facilities could use some TLC. The pull thrus were on the small side, but have enough room for our one slide and awning. Over the air TV reception was surprisingly good with digital signal for the major network stations. The free Wi-Fi signal was strong, but sporadic. Convenient to town and Bryce Canyon. We camped at Hitch-N-Post Campground in a Travel Trailer. We stayed at this park for 2 days. The managment and the other people staying there were all very friendly and helpful. The park is located in the middle of a small town that has convince stores and restaurants with in walking distance. Very busy this time of year felt lucky to get a site. Very quite most nights and lots of things to see and do this time of year here. Only draw backs are no pool and WiFi is questionable at times. We camped at Hitch-N-Post Campground in a Travel Trailer.